Firstly, as part of fully integrated risk management software, you can keep on top of everything from managing risk assessments, incident reporting and investigation, right through to implementing policies, tracking and risk auditing. As a cloud-based software, you’re also able to save time on inputting data and prevent double handling of documents, as well as access your incident reporting in real time from anywhere in the world. What’s more, we provide support every step of the way. We’ll do this by making sure the system is tailored to your needs before deploying it in the field and subjecting it to thorough testing. For your peace of mind, we comply with AS/NZS4801, ISO45001, ISO9001, ISO14001, ISO27001, OHSAS18001, to name just a few, as well as the WHS Act and Regulations and IRAP. If you’re in another country, we’ll also work around your particular privacy laws and standards for compliance. With such a comprehensive approach, you can trust MiSAFE to work with you to find a solution that won’t just stand up to the rigours of incident reporting but will also serve as personal injury claims management software. MiSAFE offers Incident Management software solutions from multiple suppliers to ensure you get the right product to record your sensitive incident data. Our incident management systems set the benchmark when it comes to recording incident information. Developed in partnership with leading multi-national organisations, Our incident management software systems can be pre-configured to report, investigate, analyse and proactively action issues across all work disciplines based on your very specific requirements. The fields that our incident management systems cover include; safety, environment, quality assurance, product quality and business risk management. All of our incident management software systems comply with ISO 9001:2015, ISO 45001:2018, and ISO 14001:2015. Our platforms are secure, reliable, and accessible from any device (including iOS and Android). Our systems can also work offline if required, and are flexible and easily customisable to your company’s processes and workflows. Our incident management software is designed to be automated as much as possible, leaving you with the peace of mind knowing that each step of the incident management process is taken care of. This includes configurable notifications, and reporting requirements to ensure each stakeholder in the incident management process meets their KPIs. 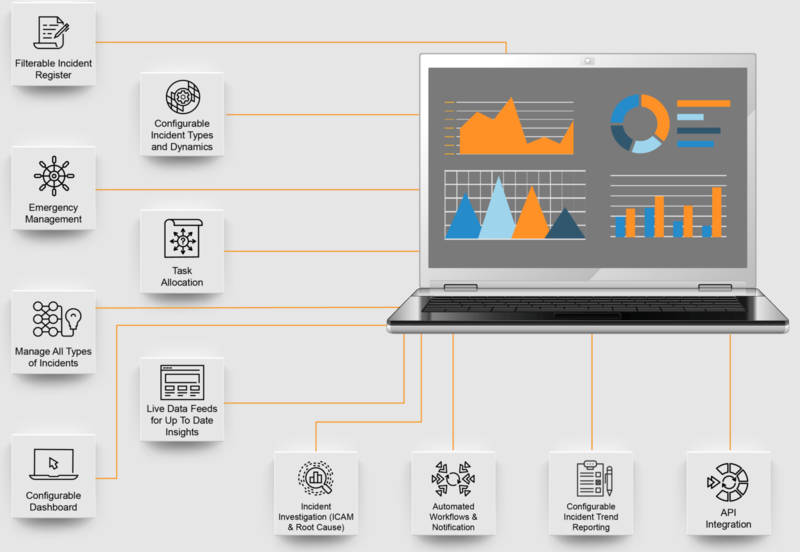 All data collected is stored in the cloud and can be easily used, understood, and collated to automatically compile business intelligence reports and scheduled board review reports. Pre-configured or Self-configurable dashboards and reporting. Getting lost with the rate and complexity of incidents at your workplace? At MiSAFE, we’re certified occupational health and safety consultants in Australia and New Zealand. With a wealth of experience in the field, we’re best placed to assess your needs and find the perfect compliant incident reporting software to match. Not only that, we offer our consultants for hire on a contractual basis. Our consultants work on an hourly, weekly, or project basis. Contact us today for a free 30-minute consultation to discuss your requirements. Ready to help MiSAFE safeguard your business with incident management software? Start by getting in touch with our team based in Queensland for a consultation. Hire one of our consultants! Tell us you're not a robot!